Description: Pale yellow or orange yellow crystalline powder, odorless. Coenzyme Q10 is a kind of ubiquinone, appears as odorless, orange-yellow crystals or powders. Coenzyme Q10 is readily soluble in chloroform, benzene and carbon tetrachloride, soluble in ether, petroleum ether and acetone, slightly soluble in ethanol and insoluble in water and methanol. It is stability under moisture and raised temperature but easily decompose under light. 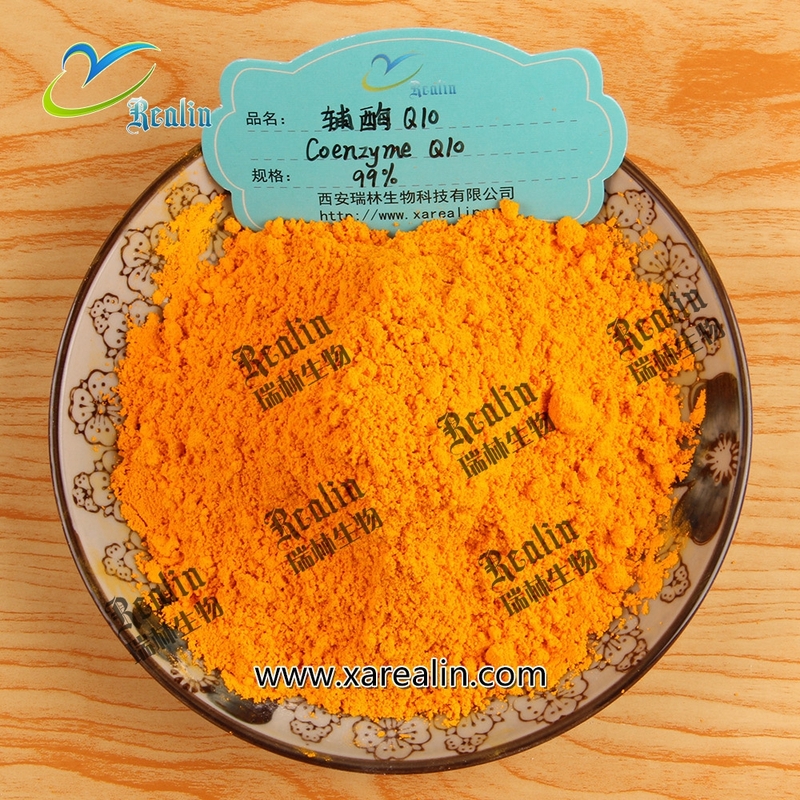 Coenzyme Q10 widely present in yeast, plants, leaves and seeds, and animal heart, spleen, liver and kidney. In humans, ubiquinone mainly in liver, heart, kidney and adrenal tissue, a rough calculation of the total content of coenzyme Q10 in between 0.5 ~ 1.5g. Decreased immune function of increasing age is the result of free radicals and free radical reactions, coenzyme Q10 as a powerful antioxidant alone or in combination with Vitamin B6 (pyridoxine) in combination inhibited the free radicals and cell receptors on immune cells differentiation and activity of microtubule associated modification system, strengthen the immune system, delay aging. Body of non-specific immune enhancer, so show excellent anti-fatigue effects, coenzyme Q10 cells to maintain a good health condition, so the body is full of vitality, energy, brain abundant. Long-term use of coenzyme Q10 to prevent aging skin and light to reduce wrinkles around the eye, as coenzyme Q10 can penetrate into the skin growth layer of oxidation of reduced photon in tocopherol can start the help of specific phosphorylation of tyrosine kinase to prevent oxidative damage to DNA, inhibition of UV irradiation of human dermal fibroblast collagenase expression, protect the skin from injury, has significant antioxidant, anti-aging effect. Cardiovascular diseases, such as: viral myocarditis, chronic cardiac insufficiency. Hepatitis, such as: viral hepatitis, subacute hepatic necrosis, chronic active hepatitis. Comprehensive treatment of cancer: can reduce the radiation and chemotherapy cause some side effects.